This post is a transcript of my oral testimony at the U.S. House of Representatives as delivered on March 16, 2017. I wish to thank the Chairs, Ranking Members and other members of the committee and subcommittees for inviting me to today’s hearing. 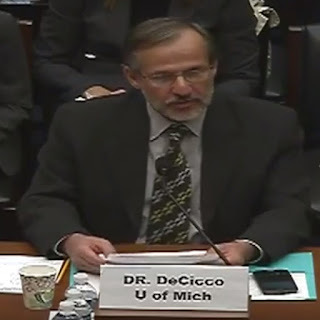 My name is John DeCicco and I am a research professor at the University of Michigan Energy Institute. My main focus is transportation fuel use and its environmental impact. I hold a doctorate in engineering from Princeton University and have worked on America's energy challenges for nearly 40 years, including 21 years at environmental organizations before returning to academia in 2009. My recent research has included scientifically rigorous evaluations of the Renewable Fuel Standard (RFS) and other policies that promote biofuels such as ethanol and biodiesel. RFS proponents claim that the policy reduces CO2 emissions. I have found that it does not. In fact, from its inception, the RFS has increased rather than decreased the amount of CO2 entering the atmosphere compared to petroleum fuels such as gasoline. My findings contradict the conventional wisdom about biofuels and reveal errors in the computer modeling on which the environmental rationale for the RFS was based. It's no surprise that some biofuel researchers and advocates have criticized these findings and those of other scientists who have also found flaws in the RFS. The claims that biofuels reduce CO2 emissions rely on lifecycle analysis, a method for comparing the carbon footprint of various fuels. When it expanded the RFS through the Energy Independence and Security Act of 2007 (EISA), Congress required EPA to evaluate the lifecycle emissions of advanced biofuels. The agency also adapted the method for its RFS impact assessments. EPA did not originate fuel cycle analysis. Rather, the method was largely developed by the Department of Energy and academic proponents of renewable energy, and its use was advocated by green groups that back the RFS. Unfortunately, lifecycle analysis makes a mistake by assuming that biofuels are automatically carbon neutral. In reality, only under certain conditions does replacing a fossil fuel with a biofuel neutralize the CO2 leaving the tailpipe. For that to occur, harvesting the corn or other feedstock must greatly speed up how quickly cropland pulls CO2 from the air. That doesn't happen for the corn and soybean harvests diverted to produce renewable fuels as mandated by the RFS. Farm data show that, in practice, the carbon neutrality condition is not met. My research team evaluated corn ethanol for which lifecycle analysis claims a 40% reduction in greenhouse gas emissions compared with gasoline. We found no significant reduction of emissions. Moreover, under typical crop rotations, net emissions could be as much as 70% higher than those of gasoline. These results do not even include indirect land-use change, which would increase biofuel-related emissions even more. So, here we are, ten years after the 2005 Energy Policy Act established the RFS and eight years after EISA. The policy has worsened CO2 emissions and it turns out that the studies used to justify it are flawed. Environmentally speaking, it is best to repeal the Renewable Fuel Standard. Short of that, helpful reforms would include scaling back the mandate to well below the blend wall and striking lifecycle analysis from the policy. Thank you for letting me share these findings and I'll look forward to your questions. See also my Testimony before the House Science Committee from November 2015 and my responses to questions submitted after that hearing.